The Detroit Pistons are a bad professional basketball team. The previous coach/GM Stan Van Gundy proved to be a horrible judge of talent. He drafted poorly and overloaded the team with bad contracts and incompatible players. Van Gundy was finally fired. The new coach, Dwane Casey is perhaps doing the best he can with what he has. The results haven't been good, though considering the talent level, perhaps Casey is a great coach. The new owner, Tom Gores, doesn't seem to have a whole lot of interest in building a winning team. Or maybe he does and just has to learn how. So far Gores has been pretty hands off at least from what the casual fan can ascertain. The product is poor. Fans have responded by staying away from Pistons games in droves. The Pistons currently rank dead last in percentage of tickets sold out of all thirty NBA teams. It's not just that the Pistons are losing. It's that they've been losing for a long time with no apparent map to get away from losing. The one consistent bright spot has been once and future all star forward Blake Griffin, who has provided the only spark of hard play and star level talent. Griffin takes things seriously. 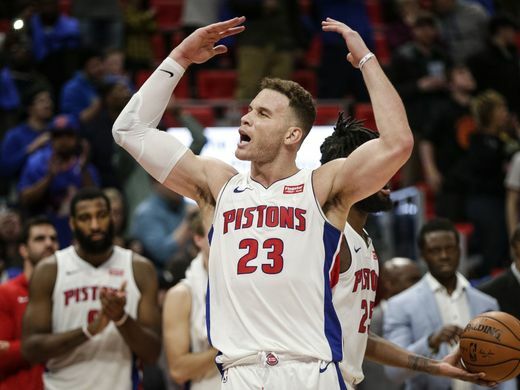 Recently after a close win over the New Orleans Pelicans, Griffin was trying to explain how the Pistons need to mature, close games out better and generally stop messing around. Of course point guard Reggie Jackson could not help himself from bombing Griffin's interview and depicting exactly the sort of tomfoolery Griffin was excoriating. As some older men in my family were fond of telling me, you can't soar with the eagles when you're hanging out with turkeys. I like Griffin, but if he wants to win he would be wise to get out of Detroit.